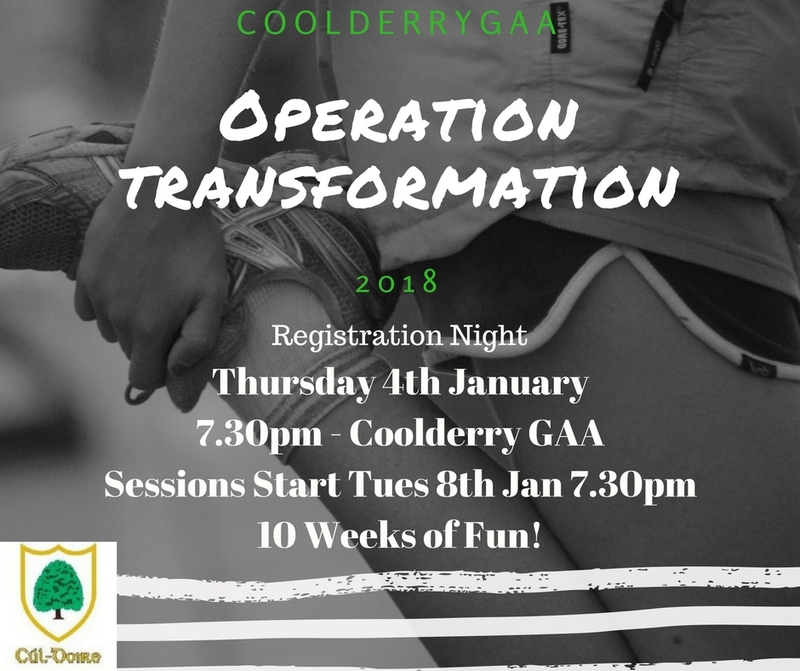 Coolderry GAA has run Operation Transformation for the past two years and will do so again in 2018. Following on from the successfully running for the past two years it will commence on the 4th of January with a Registration night and the first night of action will be on Tuesday 9th January. It involves a mixture of walking, jogging, running, circuits and other physical activities. The exercises will be designed to cater for all fitness levels and ages. The aim is to get people moving, use the facilities at the club and use the support of others to get off the couch!. The ultimate aim is for everyone to be able to do a 5k at the end of the programme. First nights exercise Tuesday 8th January at 7.30pm sharp. There will be sessions on Tuesday and Thursday for 10 weeks and you should plan now to make every effort to attend all of these 16 sessions. There will be weekend sessions also which people will be encouraged to attend. These will include walks, jogs in different locations e.g. through/around Orange Hill.